Paddy O’Leary’s Irish Pub is owned and operated by Gary Humphrey and Seamas Hunt. The Pub opened in March 2000 –guess what day???? Gary and Maureen Humphrey originally come from Pittsburgh, Pa. Gary, Maureen and family moved to the Pensacola area in May 1983. This lovely paradise has been our home ever since. Seamas Hunt is from County Wicklow Ireland. He moved to Pensacola in 1996 after graduating from college in Ireland. He and his wife Sharon and 4 kids reside in Gulf Breeze. Gary and Seamas always thought that the Pensacola area needed a real Irish Pub. In 1998 Gary and his wife accompanied Seamas and his family back to Ireland to Seamas's twin brother's wedding. Seamas gave Gary a tour of the Irish pubs that impressed him so much they decided it was their mission to introduce the people of Pensacola to a "real Irish Pub" and so Paddy O'Leary's opened. 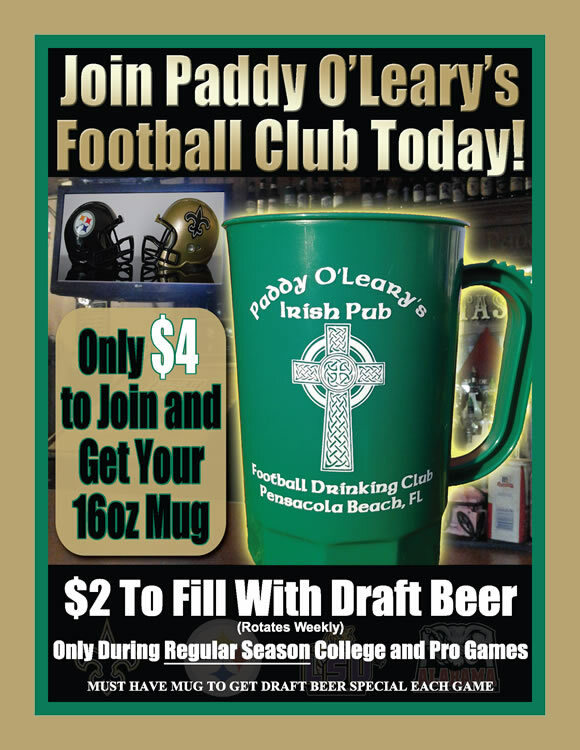 Paddy O'leary's is where the fun begins, and never ends on Pensacola Beach. You'll find Guinness, NFL Sunday Ticket, all the College Football, live music, bands, Texas Holdem, Karaoke, Open Mic, Krewe of St. Patrick, drink specials, Irish Carbomb Drink, Pints and over 100 brands of beer. Come see for yourself and enjoy a 'taste of Ireland'. Open daily 9AM.